4 - Closing Date: Midnight on 29th February 2016. 6 - The Prize: A 14-piece Cuisinart Chefs Classic Stainless Steel Cookware worth over £150. It includes 1.5- and 3-quart saucepans, 8- and 10-inch skillets, 4-quart saute, 9-quart stockpot, 7.75 inch steamer insert and 9.5-inch pasta steamer insert. 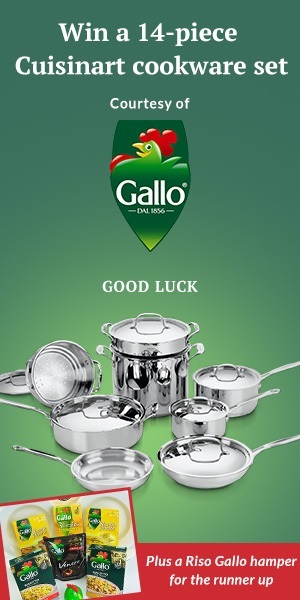 One runner up receives a Riso Gallo Gift Set, consisting of a selection of risotto rices: Riso Gallo Risotto Pronto – Mushroom and Four Cheese – Riso Gallo Arborio, Riso Gallo Carnaroli and Riso Gallo Venere Expresso. Plus 6 risotto plates, a Riso Gallo timer and a Riso Gallo shopping bag worth £50.